Welcome one and all to another reporting on SAP HANA tutorial. In this one, we try to the understand the SAP Business Objects Explorer. As the name suggests, it is a data exploration tool. This was a great tool for users to take fields and do some slice and dice reporting by themselves. Static reports don’t allow users to change fields or manipulate the chart structures or types for better understanding and deeper analysis. SAP Business Objects Explorer helped tackle this problem by allowing users to do all these things (although with it’s limitations) without needing to have a great technical expertise. SAP Business Objects Explorer was also one of the first tools to be optimized with SAP HANA. 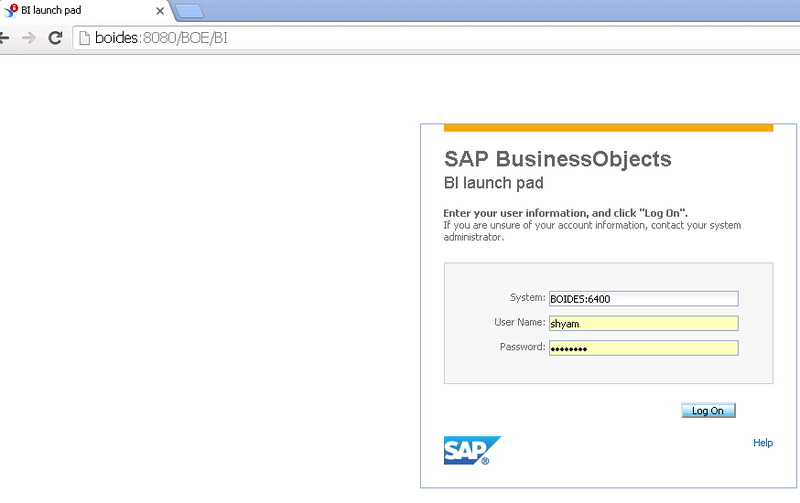 It also comes bundled with the SAP Business Objects license, adding to the customer’s joy. In recent times, SAP Lumira has surpassed SAP Business Objects Explorer as the prime data exploration tool. Lumira is leaps and bounds more powerful in this regard. But it requires a separate license, which may be a concern for some customers. Anyways, Lumira is a separate tutorial. Let’s deal with Explorer for now. Explorer, like SAP Business Objects Analysis for OLAP is designed in the Business Objects Launchpad on a web browser and requires no software installations on your system. Provide the system details and username/password provided to you by your project admin and press “Log On” as shown below. The explorer tool is opened by pressing the icon shown below. The tool would start loading before it starts. 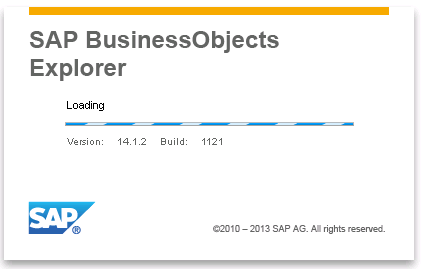 The below screen shows you what to expect once Business Objects Explorer opens. To create an explorer report, the first thing we need to do is create an Information Space. An information space can be considered a collection of the ingredients required to prepare the recipe for an explorer report. 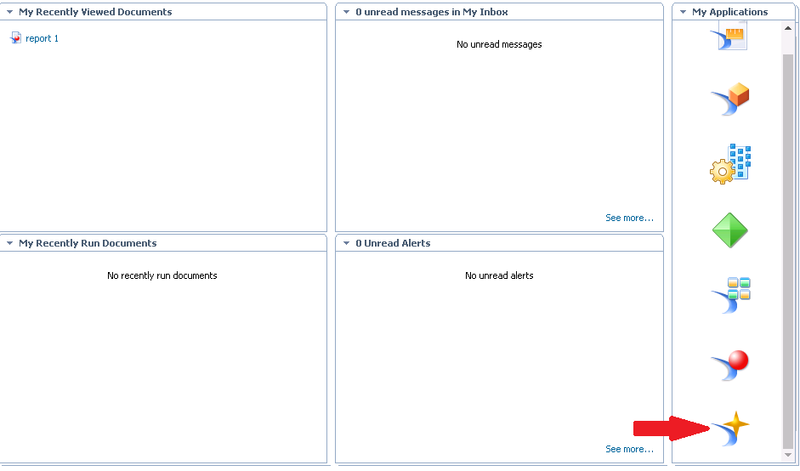 You can already see some Information spaces created by other users in the image below. To create one of your own Information space, click on the “Manager Spaces” link marked below. The Manage Spaces tab opens up and on the left, it brings along a list of options you can use to connect to the source. 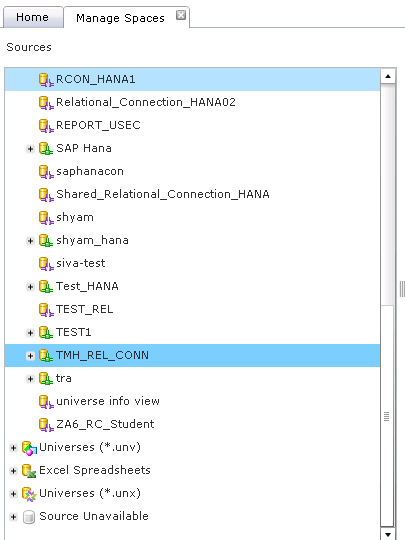 As seen below, there is a dedicated SAP HANA Connectivity option (which is via a relational connection) or via Universes or excel sheets. We learnt how to create a relational connection and also a universe in our previous tutorial. Let’s expand the SAP HANA Appliance source to see what we have underneath it. It opens up a list of available relational connections on the SAP Business Objects server. In an actual project, you will only see a few of these and most probably these would be created by an administrator and you would just be using it for your development. Here’ there are lots of them as every user on this test system made one to practice. 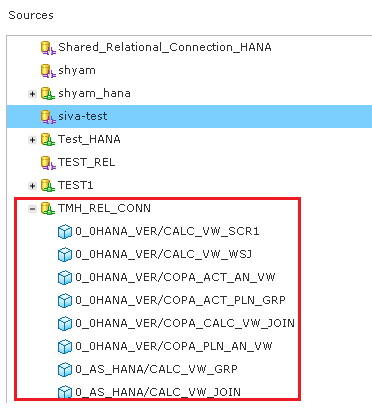 On expansion, it shows you all the SAP HANA views for the system defined in the relational connection. Here, you choose the view you require to build your information space on. But this time, let’s explore more options. We’ll use a universe instead from our previous tutorial just for scientific curiosity. You can choose the relational connection instead and ignore the universe in most cases. If you have used the SAP Business Objects Information design tool (IDT) to create the universe, it would have a .unx extension as we saw in our previous tutorial. But earlier, there was an application called Universe Design tool (UDT)which was used to create universes. 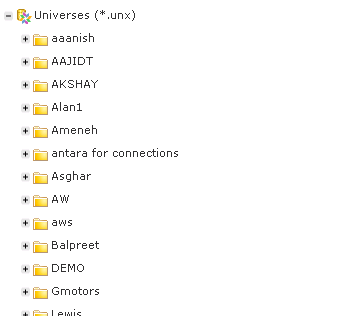 These universes had .unv extension. That’s why you have two options here – you can choose unv or unx universes. As per SAP’s best practices, only IDT should be used for creating universes and hence UDT is now obsolete. Our universes come under the .unx universe section – expand it. Continue reading the rest on the next page.